Having a solid morning meal may help prevent overeating the rest of the day, Joy Bauer, RD, told Woman’s Day. But research has consistently shown that including protein is the key to feeling full and quelling mid-morning munchies. (Sorry, doughnuts.) Think you’re too busy? Here’s a week’s worth of healthy and quick breakfast ideas. 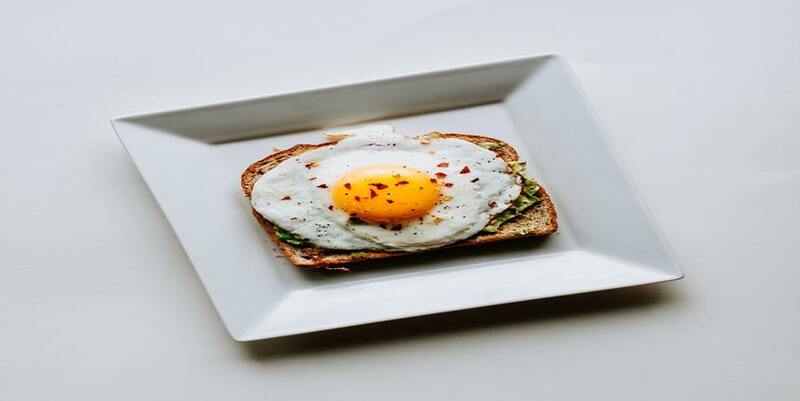 Don’t forget to try these other high protein breakfast ideas! Whole-grain oats at breakfast become even healthier in this Blackberry Pie Oatmeal recipeadapted from Oprah magazine. Top a bowl of cooked oats with 1/3 cup blackberries (or your favorite), then add 1 tablespoon chopped walnuts and one crushed graham cracker. One of the most antioxidant-rich fruits, berries are loaded with fiber and vitamin C. Walnuts’ protein and fat help make the oatmeal more satiating. Eggs take a lot less time than you think. Try this quick scrambled egg recipe for breakfast, complete with mushrooms and shredded low-fat cheese, from Women’s Health. Quick tip: Start scrambling your eggs as soon as they hit the pan, and cook until firm. Frozen waffles aren’t just for kids! Try the breakfast Berry Wafflewich recipe from Women’s Health: Pop a whole-grain waffle in the toaster while getting dressed. When it’s ready, spread on one tablespoon of peanut butter or almond butter for 3 to 4 grams of protein. Cup the waffle in your hand, add antioxidant- and vitamin-rich berries of your choice, then squeeze lightly, taco-style. Smoothies are a great breakfast option for hectic mornings, especially if you start with pre-sliced frozen fruit. A strawberry smoothie recipe combines low-calorie strawberries, which are high in vitamin C, potassium, and fiber; orange juice, with more immunity-boosting vitamin C; and protein- and calcium-rich yogurt. (Soak the blender in the sink. You’ll clean it after work.) The best low-sugar smoothies. Toast a slice of whole-wheat bread and spread it with one tablespoon of natural peanut butter and one tablespoon of raw honey, recommends mindbodygreen.com. The PB delivers about 4 grams of energizing protein, the toast about 2 grams of fiber and 4 more grams of protein, and raw honey contains phytonutrients with antimicrobial and cancer-fighting properties. It doesn’t get simpler than this nutritious combo, which is easy to eat for breakfast on the run. Toss an apple (for 3 grams of filling fiber) and an ounce of cheddar cheese (for 7 grams of protein and 20 percent of your daily calcium need) in a plastic bag and go get that bus. Skip the flavored versions (they usually have more sugar than a bowl of Frosted Flakes!) and dish up some low-fat plain Greek yogurt instead. The fat and protein will keep you full, and you can dress it up with these healthy Greek yogurt toppings. Unlike a traditional muffin, egg muffins are packed with protein, without loading up on sugar and carbs. Plus, adding spinach or tomatoes will put you well on your way to your vegetable goals even before lunch. Make a batch like Taste of Home’s Scrambled Egg Muffins early in the week, then pop them in the fridge. In the morning, a quick 30- to 60-second nuke is all they take. Don’t spend your paycheck buying avocado toast out—make it at home for quicker and cheaper! Top your toast with avocado, plus keep it interesting by adding pesto, smoked salmon, radishes, or other tasty extras. Pierce a sweet potato in several spots with a fork, then microwave it for five minutes, rotating it halfway through. Once it’s soft, use a fork to mash it up. Top it with almond butter for protein like on healthy-liv.com does, plus, cinnamon, raisins, and chopped nuts. The prep for these will take way more than seven minutes, but with a little planning, you’ll have an instant breakfast every morning. Use a recipe like thekitchn.com’s Yogurt Parfait Breakfast Popsicles to create a frozen breakfast chock-full of protein-packed yogurt and vitamin-rich berries. In the morning, just grab and go—no defrosting necessary.